Tony Michels. 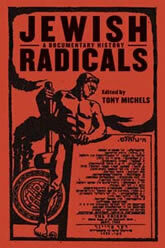 Jewish Radicals: A Documentary History. NYU Press, 2012. Jewish Radicals explores the intertwined histories of Jews and the American Left through a rich variety of primary documents. Written in English and Yiddish, these documents reflect the entire spectrum of radical opinion, from anarchism to social democracy, Communism to socialist-Zionism. Rank-and-file activists, organizational leaders, intellectuals, and commentators, from within the Jewish community and beyond, all have their say. Their stories crisscross the Atlantic, spanning from the United States to Europe and British-ruled Palestine. The documents illuminate in fascinating detail the efforts of large numbers of Jews to refashion themselves as they confronted major problems of the twentieth century: poverty, anti-semitism, the meaning of American national identity, war, and totalitarianism. In this comprehensive sourcebook, the story of Jewish radicals over seven decades is told for the first time in their own words.